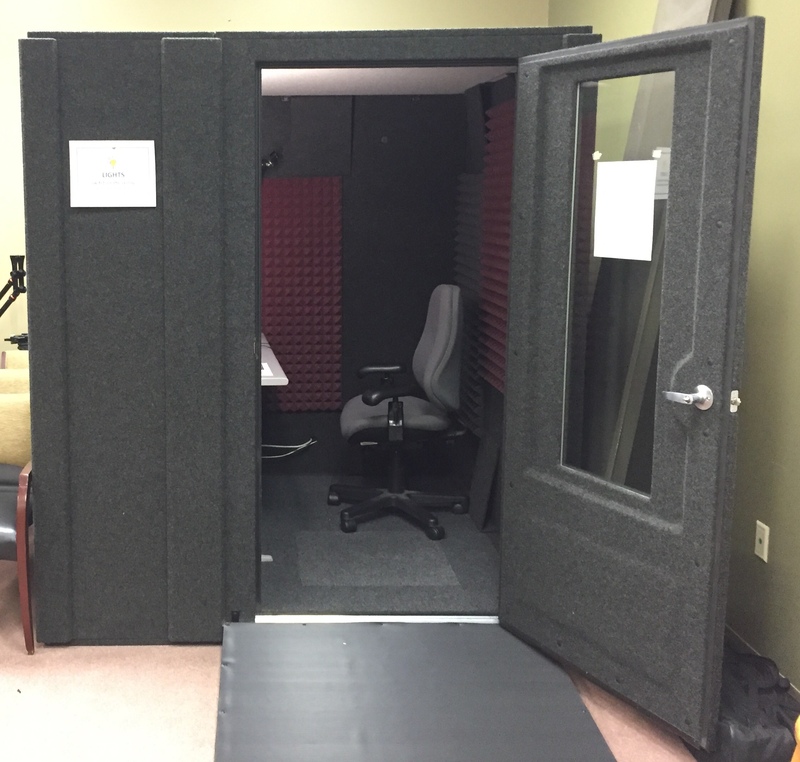 The audio recording booth is a space dedicated to fulfilling sound recording needs, such as voice over, podcast, and screencasting. This 6' x 6' enclosure significantly reduces ambient and acoustic noise. The booth is ADA compliant, with a 32” wide door with no threshold, and ramp. 1) Turn on the lights: There is a light above the computer which has two brightness settings. There is also ventilation that can be turned on with the remote. 2) Log on to the computer: Log on to the computer using your MU pawprint and password. 3) Adjust the sound board: The sound board has an on-switch located in the back to the right. The settings have been set to our specifications which you may adjust according to your needs. If you need assistance, please ask an available staff member. We ask that you return the settings to their original positions. For audio recordings, it often helps to have a script. The script can be placed on the monitor to the right so that it can be read while you are capturing the screen on the other monitor. If you are integrating video as well, you may put cues for yourself in the script (i.e. next slide, click here, or type this). When recording, make sure that the microphone is set to “USB Audio CODEC” and not the built-in option. Please note that the “USB Audio CODEC” will only appear once the soundboard is turned on. Camtasia includes a recorder which captures screen audio and video (ideal for creating screencasts or presentation voiceovers) and an editor featuring a multiple timeline interface and recording enhancement options. Additional multimedia components may be added from any other source and integrated into the timeline. Audacity is a free, easy-to-use, multi-track audio editor which allows you to record live audio; cut, copy, splice, or mix sounds together; employ numerous effects (such as change the speed or pitch) and more. Adobe Audition can be used for a variety of sound recording needs. 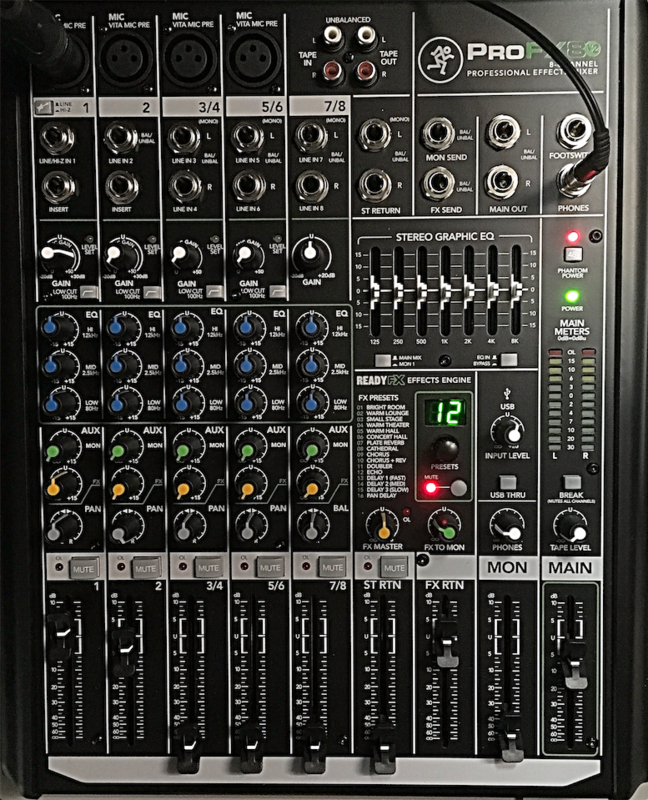 Record, edit, and mix audio for video, podcasts, and effects. GarageBand is a fully equipped music creation studio right inside your Mac — with a complete sound library that includes instruments, presets for guitar and voice, and an incredible selection of session drummers and percussionists. With Touch Bar features for MacBook Pro and an intuitive, modern design, it’s easy to learn, play, record, create, and share your hits worldwide.